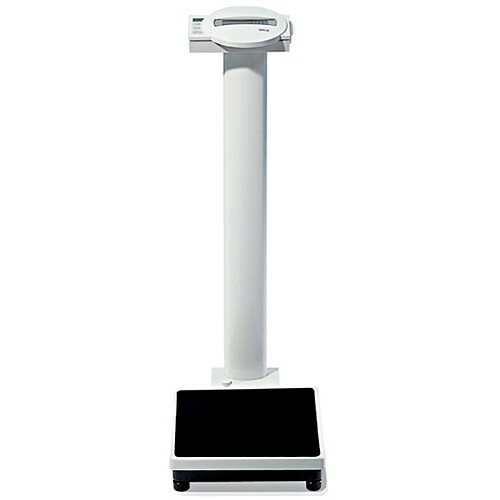 The Seca 769 Electronic Column Scale with BMI Function is an intelligent weighing and measuring device. The column scale includes a measuring rod, the Seca 220, and transport castors. It has a BMI function, which evaluates the nutritional condition of a patient and provides a reliable and accurate reading. To determine the body mass index (BMI), the patient’s height and weight is entered on the keypad of the Seca 769 Electronic Column Scale and then the BMI of the patient is given. The digital scale has an easy-to-read, large display comprised of brightly illuminated emerald numbers. The column scale arrives complete with the measuring rod, the Seca 220, so both weight and height can be easily determined in just one-step. The transport castors make moving the column scale around easy and virtually effortless. Overall, the Seca 769 Electronic Column Scale is a versatile, low-maintenance and site-dependent device. It uses economic battery operation, 6 AA 1.5 V batteries, which are not included with purchase. The sturdy construction of the Column Scale will give you long and loyal service. Seca has been putting its experience at the service of health for over 150 years now, and as market leader in many countries of the world, is always setting new standards with its innovative developments for weighing and measuring. The Seca 769 Electronic Column Scales with BMI Function comes with a limited 2-year manufacturers warranty.